The Soybean Production Meeting is scheduled for Wednesday, February 6 from 8 to 10 a.m. at the Camden United Methodist Church, 197 NC HWY 343 S., Camden, NC. Two specialists from NC State University will be presenting on maximizing soybean production, Dr. Rachel Vann, Extension Soybean Specialist, and Dr. Dominic Reisig, Entomology Specialist. Two hours of N, O, D, & X pesticide credits will be offered. Breakfast is provided and sponsored by the NC Soybean Producers Association. A pre-registration link and instructions are listed below to obtain a meal count. On Thursday, February 7 from 10 a.m. to noon, Mr. Austin Brown, Agriculture Extension Agent – Camden County and Mr. Clay Hudson, N.C. Department of Agriculture & Consumer Services will be offering a Private Pesticide Applicator Recertification 2 Hour “V” Training upstairs in the Historic Camden County Courthouse, 117 NC HWY 343 N, Camden, NC. This course offers two hours of the required “V” credits. 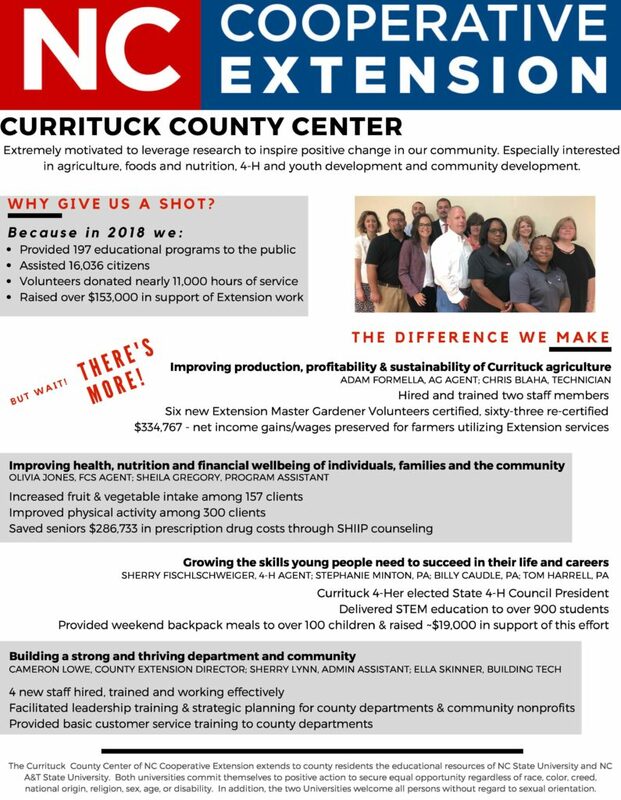 After this meeting, the next opportunity in Currituck/Camden counties to obtain these “V” credits will not be until August 2019, before the September 30, 2019 deadline. On Wednesday, February 20, Mr. Jamie Stallings is hosting the Northeast Ag Expo Small Grains Expo Field Day. This event begins at 9 a.m. with a meal and goes until noon. The field day will be held at Jamie Stallings and Sons’ Farms, 120 Selwin Rd. Hobbsville, NC. One and a half hours of N, O, D, & X credits will be offered. Speaking will be Dr. Ron Heiniger, Dr. Christina Cowger, Dr. Angela Post, and Dr. Wes Everman. A pre-registration link and instructions are listed below to obtain a meal count. Changes made to the labels of dicamba-containing products labeled for over the top use in cotton and soybean have created new requirements for 2019. Anyone planning to apply dicamba (Engenia, FeXapan, or Xtendimax) over the top to dicamba-tolerant cotton or soybeans must be a certified applicator, and attend a mandatory Auxin Herbicides – Best Management Practices training (even if the training was attended in past years). This requirement mandates that whoever is driving the sprayer needs to have a private applicator pesticide license (those working under the supervision of a certified applicator may no longer make applications), before then attending one of the mandatory trainings. On February 26, there will be two Auxin Herbicides – Best Management Practices trainings in northeastern North Carolina. One will be held at the N.C. 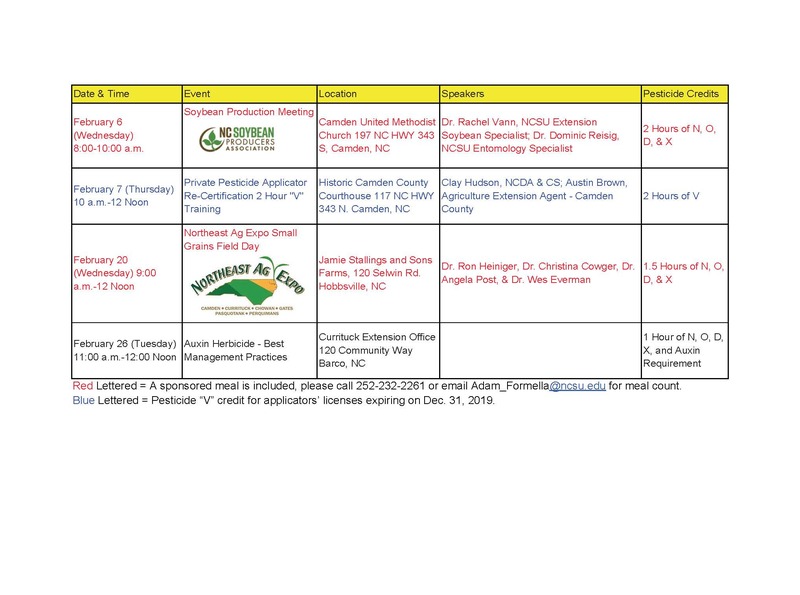 Cooperative Extension, Currituck County Center at 11 a.m. and the other will be held at Leon Nixon’s Catering, 749 Virginia Rd., Edenton, NC at 3 p.m. Labels for 2,4-D chlorine-containing products (Enlist One and Enlist Duo) do not require that an applicator be certified to apply these products over the top. However, the NC 24(c) label requires that you must attend an Auxin Herbicides – Best Management Practices training to legally apply 2,4-D chlorine over the top. 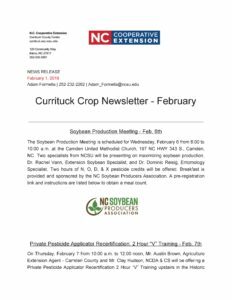 Pre-registration for the Soybean Producer’s Meetings and the Northeast Ag Expo Small Grains Field Day are required for meal counts. You can register online or contact the office at 252-232-2261. No payment is required for either of the provided meals. For more information or for accommodations for persons with disabilities please contact Adam Formella at 252-232-2262 or email Adam_Formella@ncsu.edu no later than five business days before the event.